In a most interesting article in Rupestreweb, Rainer Hostnig (2011) describes some specific petroglyphs that were discovered by Peruvian archaeologist Walter Zanabria in a cave near Achahui (Provincia de Espinar, Departamento de Cusco, Perú) in 2003. The main panel at Achahui (Figure 1) is dominated by a petroglyph of a large dotted zoomorph of considerable size, which is followed by smaller dotted zoomorph. To its right are some smaller, also dotted zoomorphs, as well as several anthropomorphic figures in different positions and attitudes. Although I accept the interpretation of Rainer Hostnig that indeed (most of) the zoomorphs depict ‘felines’, in the following paragraphs I prefer to speak of ‘zoomorphs’, especially as in several cases the species of the biomorphs remains undetermined. Figure 1. The main panel at Achahui, Provincia de Espinar, Departamento de Cusco, Perú. Drawing after Rainer Hostnig 2011: Fig. 7. 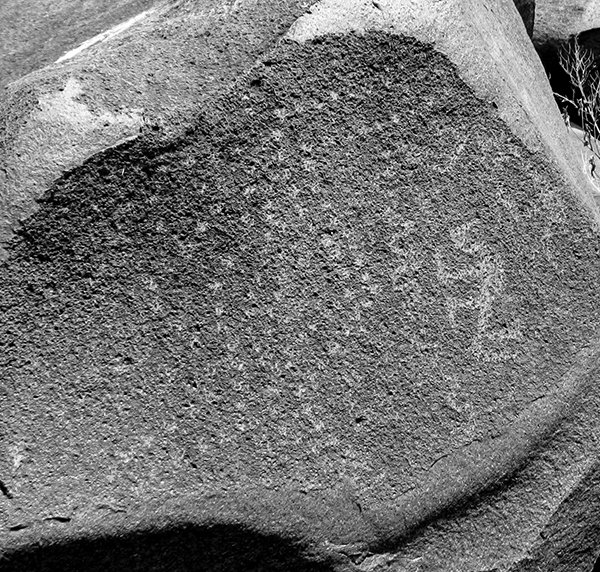 In his article Rainer Hostnig mentions four other rock art sites in the Andes where the same technique occurs in zoomorphic images (Sincho Colorado and Coimata in Bolivia; Cerro Colorada and - only mentioned, not illustrated by Carlos Aschero  - Antofagasta de la Sierra in Argentina), but he also remarks that “La técnica de producción de petroglifos mediante el tratamiento puntiforme sin uso de líneas de contorno .... es poco común en el arte rupestre andino y representa (hasta ahora) un unicum en el arte rupestre del sur peruano”. I fully agree with Hostnig that only very few images in Andean rock art have been manufactured with dots-only. However, in the rock art of southern Peru several more ‘dotted zoomorphs’ have been recorded and some may also depict ‘felines’. Therefore, the Achahui examples are not unique. As a sequel to Hostnig’s paper I hereby present a brief, mainly graphical overview of other instances of ‘dotted zoomorphs’ that I know of to exist in the rock art of Chile and Peru. GROUP I: The first group consists of zoomorphic rock art images that completely are made up of only dots. Also, not a single part of the body (like head or legs) is made up of lines or fully pecked areas. In the instances presented here (Figures 1 to 6), a contour-line has not been manufactured, not even a part of it. Figure 2. Completely dotted zoomorphic petroglyph from the Majes Valley, southern Peru. Notice the V-shaped head. Photograph © by Maarten van Hoek. Figure 3. 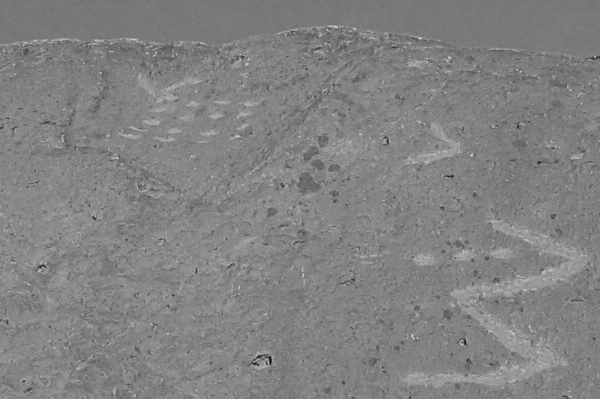 Completely dotted zoomorphiglyph from the Majes Valley, southern Peru. When one notices a completed dotted zoomorphic petroglyph without contour lines, it does not mean that contour lines were not necessarily intended to be present. The manufacturer may well have abandoned the image (as I will demonstrate with examples in the third group; see Figure 15) or perhaps he or she decided not to create a fully pecked image (see Figure 14). Figure 4 shows a completely dotted zoomorph (framed) - apparently looking to the right - that may well have been intended to receive an outline, resembling the dotted zoomorph above the frame. The dotted and outlined zoomorphs of the Majes area are a true hallmark of the rock art iconography of that region and thus it can be expected that unfinished examples occur. Figure 4. Completely dotted zoomorphic petroglyph (framed) from the Majes Valley, southern Peru. In some cases it is hard to discern a zoomorph in an apparently unorganised chaos of dots. Two special examples are shown in Figures 5 and 6. The dotted petroglyph in Figure 5 may well depict a zoomorph; a fish or a frog perhaps? 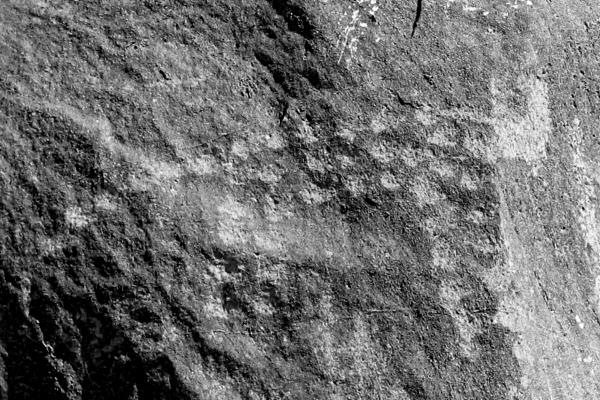 Figure 6 shows two dotted petroglyphs. The arrangement on the left may represent the image of a large frog seen in bird’s eye view. 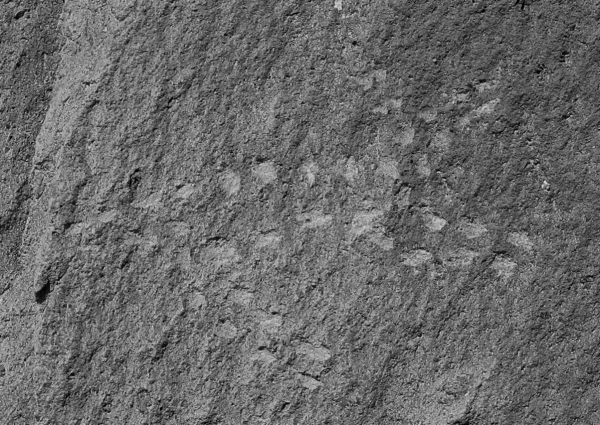 At this site also several abstract images proved to have been manufactured with only small dots; not cupules, though (Van Hoek 2012: 122, 123 and 124). Figure 5. Completely dotted zoomorphic petroglyph from the Chancay Valley, northern Peru. Figure 6. Completely dotted zoomorphic petroglyph from the Chancay Valley, northern Peru. Figure 7. Dotted zoomorphic petroglyph from the Majes Valley, southern Peru. Figure 8. 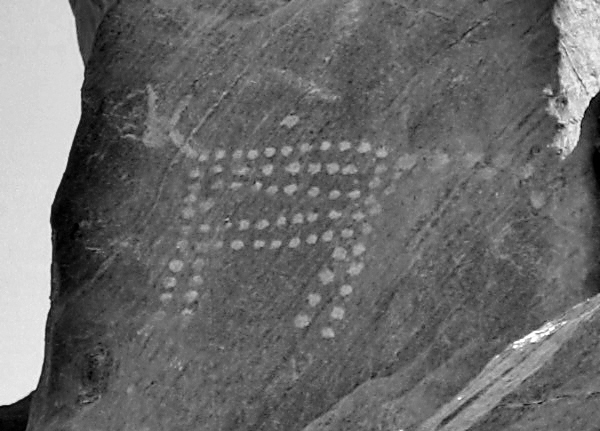 Dotted zoomorphic petroglyph from the San Juan Valley, southern Peru. Figure 9. Dotted zoomorphic petroglyph (‘feline’?) from the San Juan Valley, southern Peru. Figure 10 shows a part of a large, vertical panel in the Quebrada de Camiña, northern Chile. 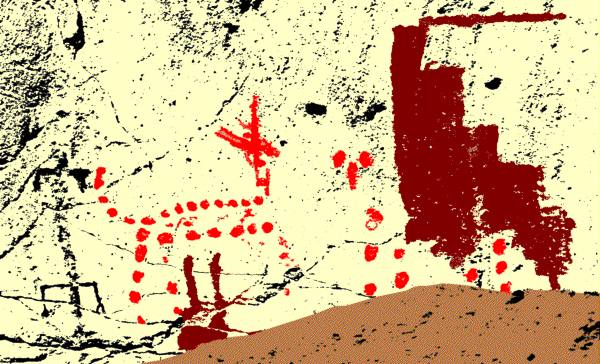 It includes a rock painting of a quadruped - most likely a camelid - drawn with red dots, except (intentionally?) for the head. To its right is possibly a second dotted zoomorph that apparently has been superimposed by a large stepped design. All images have been drawn in the same red colour. Figure 10. Dotted zoomorphic rock painting(s?) from the Quebrada de Camiña, northern Chile. Drawing © by Maarten van Hoek, based on a photograph by Rosa María Cuesta ( 2012). Also found in northern Chile is an extensive rock art site in the Valle de Lasana; part of the Upper Loa Valley. In the Sector of Chacras Viejas at Chiuchiu is a vertical rock panel, located rather high up the steep slope. One of three decorated panels bears the petroglyphs of two large dotted zoomorphs (possibly ‘felines’) that are associated with two anthropomorphic figures (the fainter anthropomorph - green arrow - is missing in Figure 11). However, Rainer Hostnig (2011) remarks that those ‘felines’ “... fueron producidas mediante el delineado y no a través del punteado del contorno o del cuerpo entero”. Hostnig probably referred to the drawing in an inventory of the rock art at Lasana (Rojas 2005). On page 97 of this inventory is a drawing of the two zoomorphic petroglyphs in which, however, some flaws can be spotted (Figure 11). The larger (upper) ‘feline’ is almost entirely made up of dots, although much of its tail also comprises small rectangular ‘dots’. Moreover, its head has been drawn with grooves. The two front legs (one emerging from the head) are also made of pecked grooves. The drawing only features one hind leg (blue arrow in Figure 11), while actually there are two, both comprising superficially pecked grooves, not dots. The smaller ‘feline’ only seemingly has no head. But on inspection of the panel it proves to have a small head after all (yellow arrow in Figure 12). 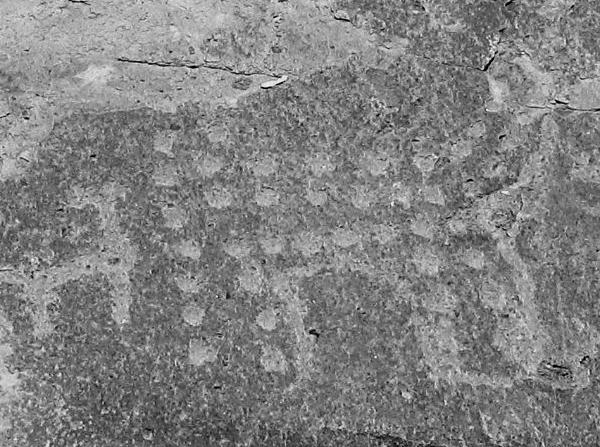 As the head may be regarded as a large dot, the smaller feline is the only petroglyph that is completely made up of dots (disregarding the fact that also its tail comprises small, isolated rectangles). Although the drawing does not show any hind legs (red arrow in Figure 11), the dotted extremities are clearly visible in the photo (Figure 12). Figure 11. Dotted zoomorphic petroglyphs from the Valle de Lasana, northern Chile. Drawing © by Maarten van Hoek, based on a drawing by Jannice Rojas Vásquez (in Rojas 2005). Figure 12. Dotted zoomorphic petroglyphs from the Valle de Lasana, northern Chile. Further NW in Chile is an extensive petroglyph site in the Quebrada de Tarapacá. One of the boulders has a petroglyph of a zoomorph (‘feline’?) that has rather large dots for legs, a fully pecked tail and a head with miniature ears, while the body may be regarded to be composed of randomly distributed small dots (Figure 13). 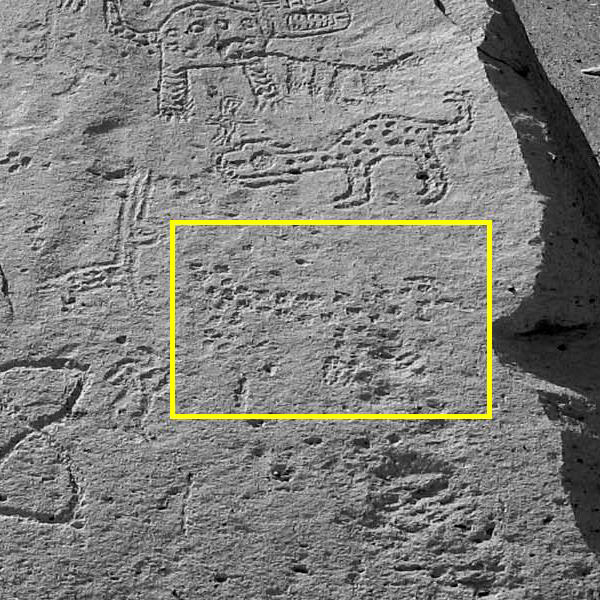 Much further north in the Quebrada de Camarones, still in northern Chile, is a boulder with a small petroglyph of a zoomorph (probably a ‘feline’) that has a dotted, curled tail and legs, while its dotted body is partially outlined. The head is fully pecked, again showing ears. Figure 13. 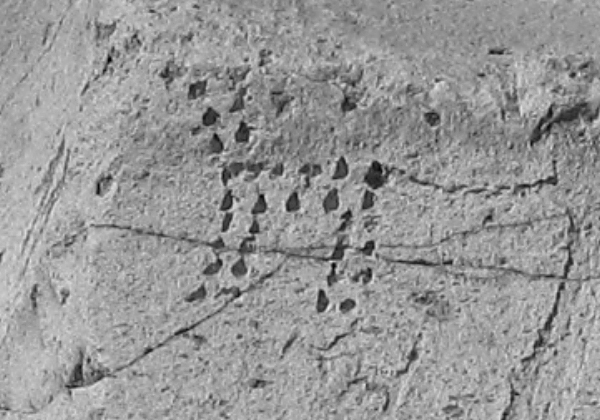 Dotted zoomorphic petroglyph from the Quebrada de Tarapacá, northern Chile. 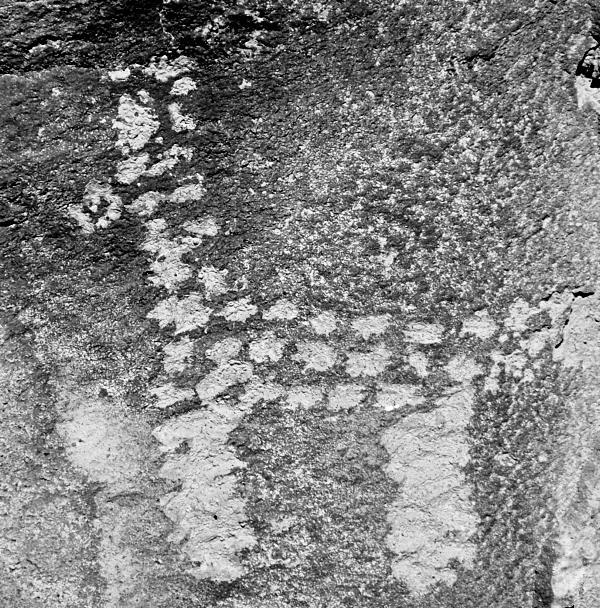 In the Majes Valley, southern Peru, is a medium-sized boulder with a dotted zoomorph (probably a camelid) that is made up of large dots (Figure 14). However, as the two legs are clearly fully pecked, this probably represents an unfinished petroglyph, as most likely it was the intention to produce a completely fully pecked zoomorph. Figure 14. Partially dotted zoomorphic petroglyph from the Majes Valley, southern Peru. Photograph (rotated) © by Maarten van Hoek. GROUP III: The third group encompasses images that are made up of dots, but that are partially outlined. Most likely the rare examples of this group represent abandoned attempts to manufacture a completely outlined, but still dotted, image. Figure 15 clearly shows a dotted zoomorph, of which only part of the contour groove was completed. The head most likely has flaked off (it is therefore uncertain whether the animal looks to the right or to the left). Figure 16 shows two groups of small cupules that look like the curved bodies of ‘felines’. 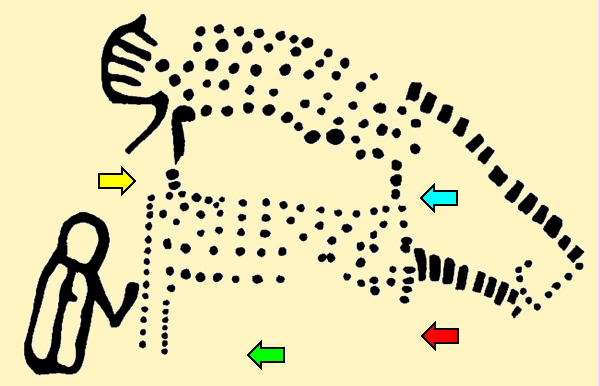 This interpretation is confirmed by the isolated but outlined head of a Majes Style ‘feline’ that ‘floats’ very near the uppermost group of dots (yellow arrow in Figure 16). Figure 15. Unfinished zoomorphic petroglyph from the Majes Valley, southern Peru. Figure 16. Unfinished zoomorphic petroglyphs (felines?) from the Majes Valley, southern Peru. 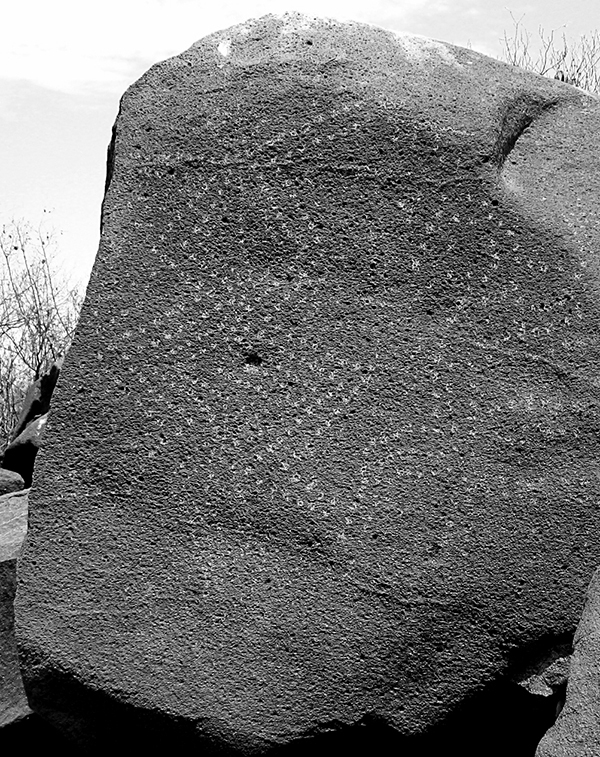 Finally, it cannot be ruled out that in some cases rock art images initially were sketched on the rock surface by lines of dots that were connected at a later stage (Figure 17). A good example is the bisected cup-and-ring petroglyph at Buttony, Northumberland, England, that I discovered in 1984. This cup-and-ring motif definitely does not represent an instance of the so called “rosette” design that occasionally occurs in the rock art repertoire of the British Isles, although it cannot be ruled out that several “rosettes” in the rock art of the British Isles are actually abandoned cup-and-ring marks (Van Hoek 1990: Fig. 2 and 7). Figure 17. 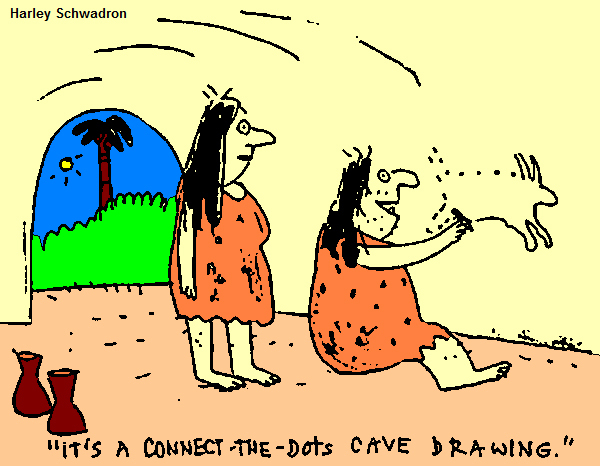 “Ancient artists connecting dots”. Cartoon by Harley Schwadron, coloured in by the author. Copied from TARA’s Facebook Page. Figure 18. 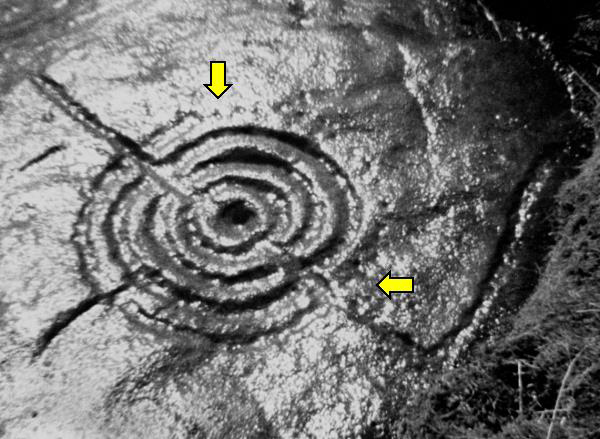 Cup-and-ring petroglyph from Buttony, Northumberland, England, showing the semi-circle of small dots of the unfinished petroglyph between the two yellow arrows. Photograph © by Maarten van Hoek. 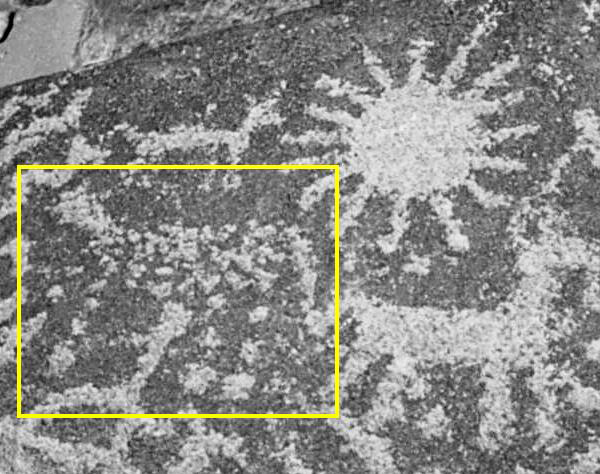 First of all it proves that there are some more rock art images in Andean rock art that are composed of only dots or small cupules. Yet, sometimes it is difficult to decide whether an image was made of dots or just loosely pecked. An illustrative example is the zoomorphic petroglyph on Roca Cucharayacu 4 near Balsapuerto, northern Peru (Orefici 2013: Foto 14). In general there are three possibilities. 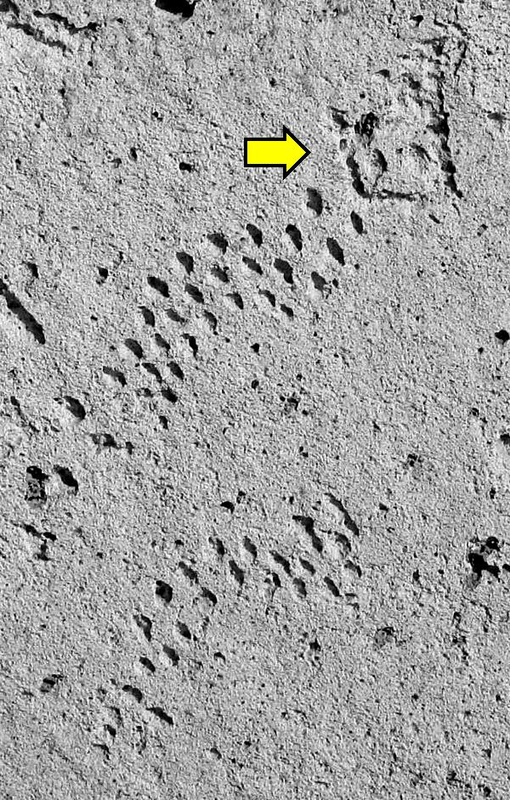 First of all, it is possible that a completely dotted image, without any (contour) line or fully pecked area, was intended as it is seen on the rock surface today (Figure 1). Completely dotted images with a (small) fully pecked body part may as well be premeditated, especially when only the head is fully pecked (Figure 9). Secondly, dotted zoomorphs may also represent unfinished images that were intended to be turned into fully pecked images (Figure 14) or completely outlined images (Figures 15 and 16). Finally, dotted images may include rows of dots that were intended to be connected in order to finish the image (Figure 18). It proves that often the graphical context often determines whether a dotted design was intended to remain dotted, was supposed to receive an outline or should become fully pecked. In some cases the dots may have served as a preliminary sketch to be finished at a later stage. Yet, in many instances it will remain uncertain what actually was the intention of the manufacturer of the ancient images. However, notwithstanding all sorts of uncertainties, I am convinced that the dotted Achahui petroglyphs described by Rainer Hostnig are true examples of dotted zoomorphs. Please be aware that any URL included in this paper (functional as per December 2015) may be broken or even hacked. Please notify me if any broken link occurs. Aschero, C. 1988. Pinturas rupestres, actividades y recursos naturales: un encuentro arqueológico. En: Arqueología Contemporánea Argentina. Actualidades y Perspectivas. Edic. Búsqueda, pp. 109 - 145, Buenos Aires s. d Periodo arcaico: cazadores - recolectores y pastores tempranos. The URL provided by Rainer Hostnig (2011) does not function anymore. Hostnig, R. 2011. Los felinos puntiformes de Achahui, provincia de Espinar, Cusco. In: Rupestreweb. Also available at Academia. Orefici, G. 2013. Ocupación humana, fases culturales y expresión iconográfica de los petroglifos del área de Balsapuerto y Yurimaguas. In: Lo que las piedras cuentan. Cumpanamá y los petroglifos de Balsapuerto. Lima, Peru. Rojas, O. M. 2005. “El arte rupestre de Valle de Lasana” (Sectores Pona, Descanso en Lucio y Chacras Viejas). Museo de Historia Natural de Calama. Calama, Chile. The URL provided by Rainer Hostnig (2011) does not function anymore. PDF no longer freely available on-line (anyone may ask the author for a free copy). Van Hoek, M. 1990. The rosette in British and Irish rock art. Glasgow Archaeological Journal. Vol. 16; pp. 39 - 45. Glasgow, Scotland. PDF available at Academia. Van Hoek, M. 2005. 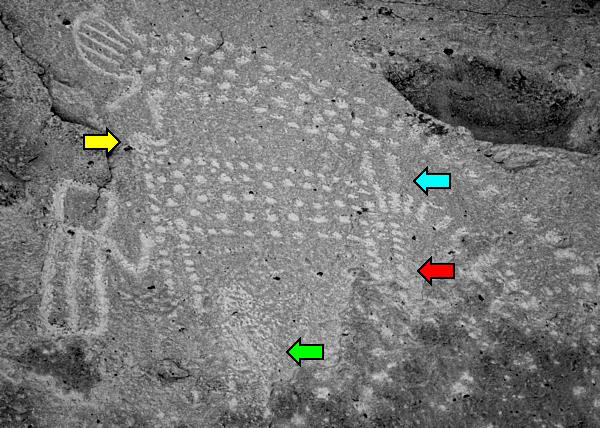 Toro Muerto, Peru: Possible Prehistoric Deletion of Petroglyph Details. Adoranten Vol. 2005; pp. 73 - 80. Underslös, Sweden. PDF available at Academia. Van Hoek, M. 2006. Toro Muerto, Perú. Posibles alteraciones prehistóricas en detalles de petroglifos. In: RUPESTREWEB. Traducción de Diego Martinez Celis especial para Rupestreweb. Publicado originalmente en: ADORANTEN 2005, the Journal of The Scandinavian Prehistoric Society, Underslös, Sweden. PDF available at Academia. Van Hoek, M. 2012. Cerro Mulato: Rock Art of the Reque-Chancay Drainage, Peru. Privately published. Oisterwijk, The Netherlands. Van Hoek, M. 2015a. The Case of Guelta Oukas. Desecrated Rock Art Panels in the Anti Atlas of Morocco. In: TRACCE On-Line Rock Art Bulletin. PDF available at Academia. Van Hoek, M. 2015b. The Potash Sheep Shifters. Bighorn Petroglyphs of the Southwest. In: TRACCE - On-Line Rock Art Bulletin. Fully illustrated PDF available at Academia.